Whip the cream and set aside. To make the base, first off, use about 1/3 the cake crumbs and spread it out on the bottom of the dish. If you are using a very large dish you may need more. Press the crumbs down and pour half of the sherry and syrup from the canned fruit so that the cake crumbs hold. The base of the trifle should be about half inch thick. Arrange about 1/3 of the fruits on top of the cake. Spread a layer (about half inch thick) of whipped cream over the fruit. 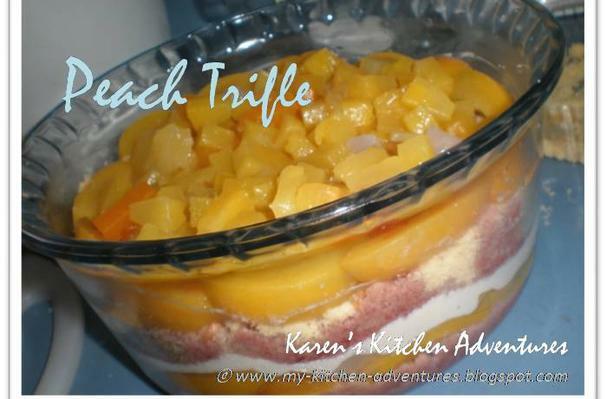 Repeat with cake crumbs, fruit and cream….and ending with cream. Once done, stick it in the fridge for about 20-30 mins to chill then serve.